Here I go for another adventure in the mountains! To walk, discover new places, to live and enjoy my life and of course, to photograph. Today’s ride will be easy, at least on the logistics side of it. 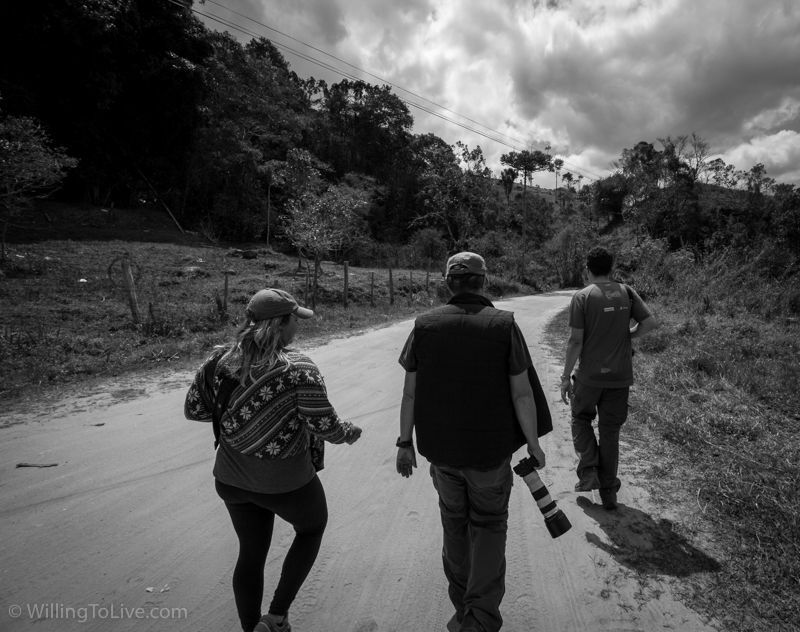 It’s one of the great photowalks organized by Waldyr Neto, or, as he calls it, a photography expedition. Do you want more adventures like that? Join us! It was a paid trip and lasted three days, Friday, Saturday and Sunday, and that Thursday was a holiday (Brazilian independence day). With Waldyr, you do not have to worry about accommodation, food, guide and transportation to trails and etc., everything is already inside the trip package. The idea is that you focus on the photography and enjoy the ride. The only thing that is not included is to arrive at the accommodation, after that, everything is alright. Três Picos and Vale dos Frades region. 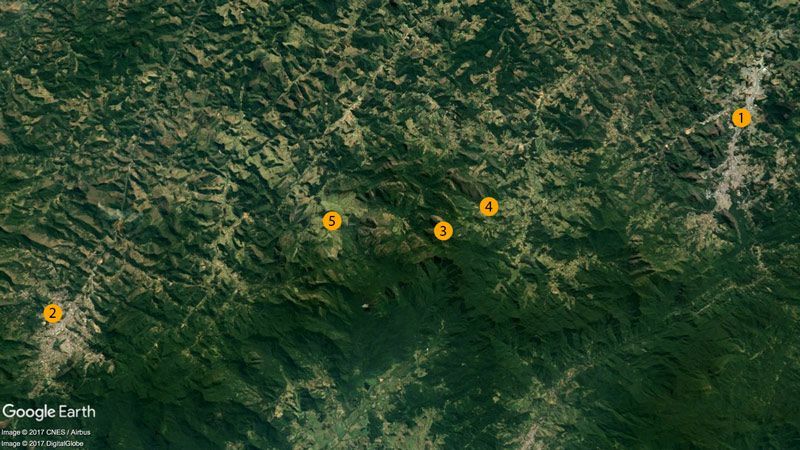 Nova Friburgo (1), Teresópolis (2), Três Picos (3), Refúgio Canto da Pedra (4), Vale dos Frades (5). This image is not mine, credits: Google Earth, Image © 2016 DigitalGlobe, Image Landsat, Data SIO, NOAA, U.S. Navy, NGA, GEBCO, Image © 2016 CNES/Astrium. 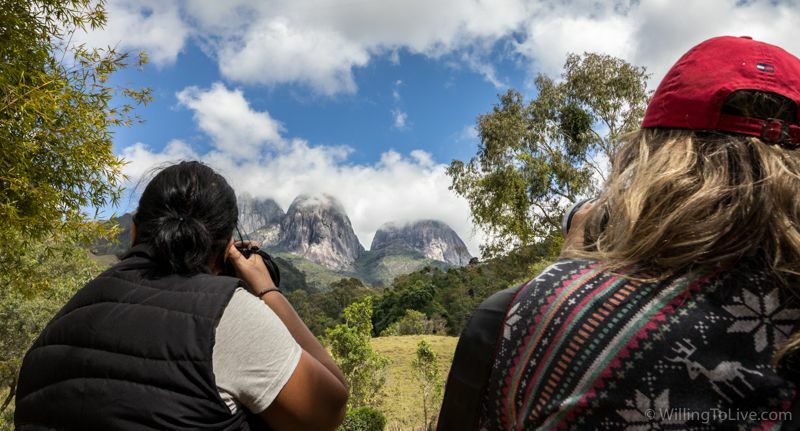 We went to photograph the region of the Três Picos (en: “Three Peaks”) and Vale dos Frades (en: “Valley of the Friars”) in the state of Rio de Janeiro, Brazil. 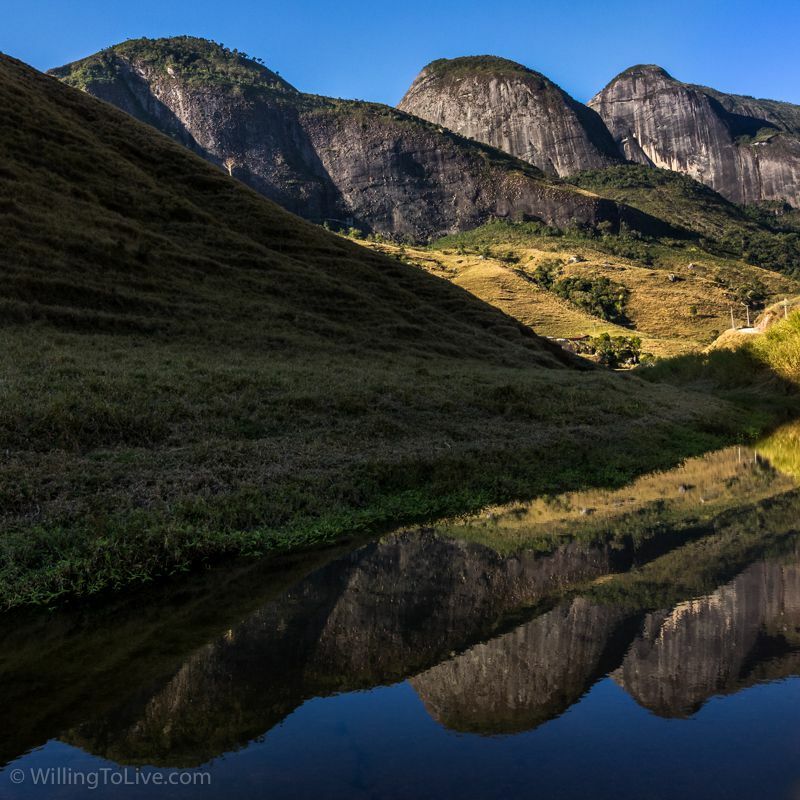 This place is located between Teresópolis and Nova Friburgo. As the name suggests, it is a region of mountains and valleys. 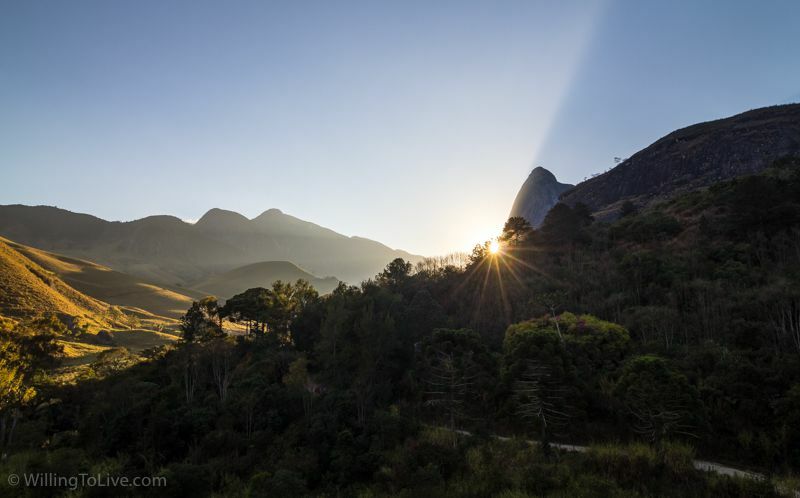 We will take advantage of the place to photograph focused on natural landscapes in a mountainous region. Given my past trips, you that follow the blog will realize that they are my favorite place. Mountains are where I can easily disconnect from the rest of the world and enjoy the moment without thinking of anything else. 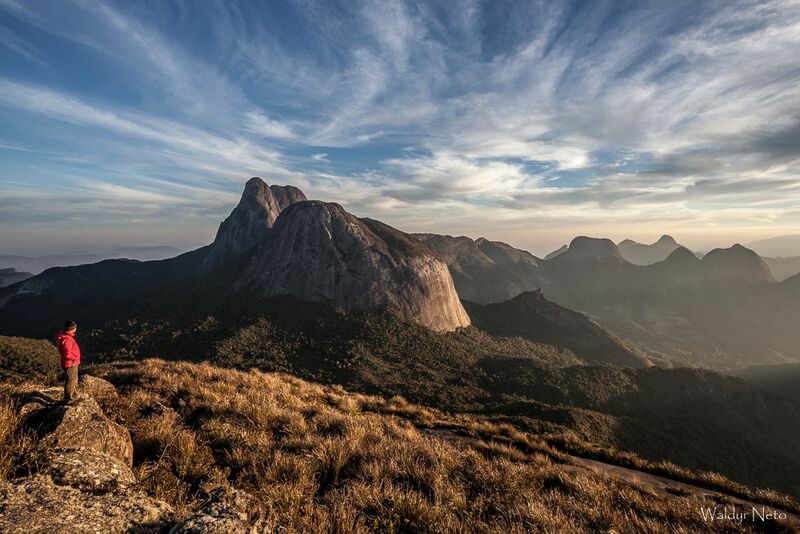 The region is well known in Brazil for climbing. In fact, based on what the guys over there explained to me, it is the most important climbing region in the country. 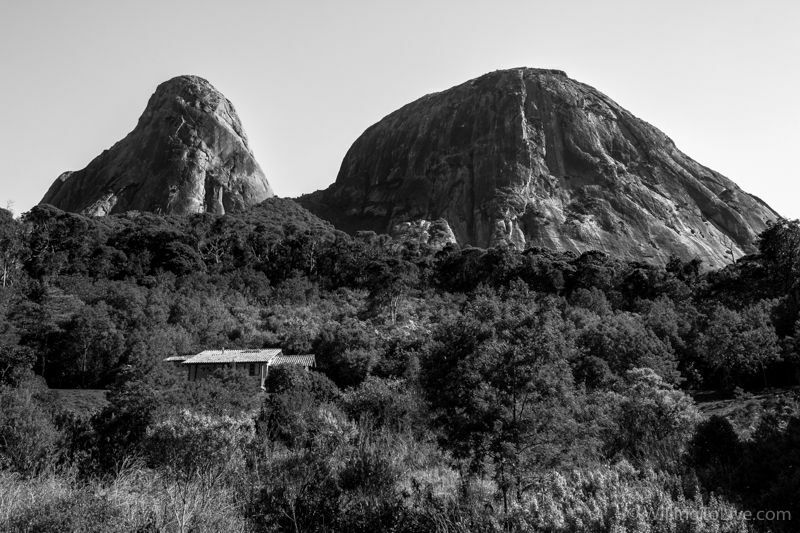 Curiously, one of the most respected climbers in the region is the owner of the place where we stayed, Refúgio Canto da Pedra, his name is Alexandre Portela. Refúgio Canto da Pedra is a simple but very good place. It was booked only for our group. 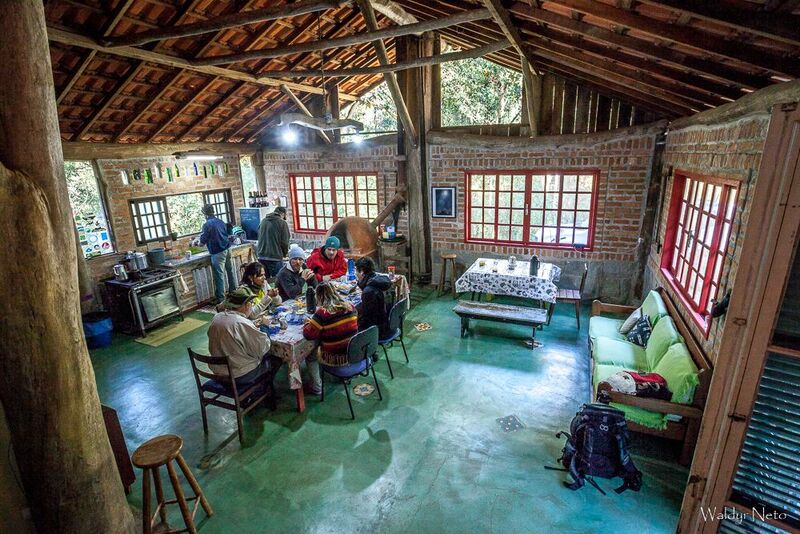 In the photo below, you can see where we make our meals (all included in the tour), the refrigerator (which can be used by you) and the bathrooms. There are two bathrooms, both with electric showers with hot water, but only one shower can be turned on at the same time, otherwise, you will create an electric power outage hahaha. We having breakfast. This image is not mine, it is from the photographer and organizer of the photowalk, Waldyr Neto. Upstairs, there were some thin mattresses available and of course, space for you to put your things and extend your sleeping bag. Basic rule, you can not go on the second floor wearing your shoes or hiking boot. One more thing, in the refuge there is no cell phone signal. 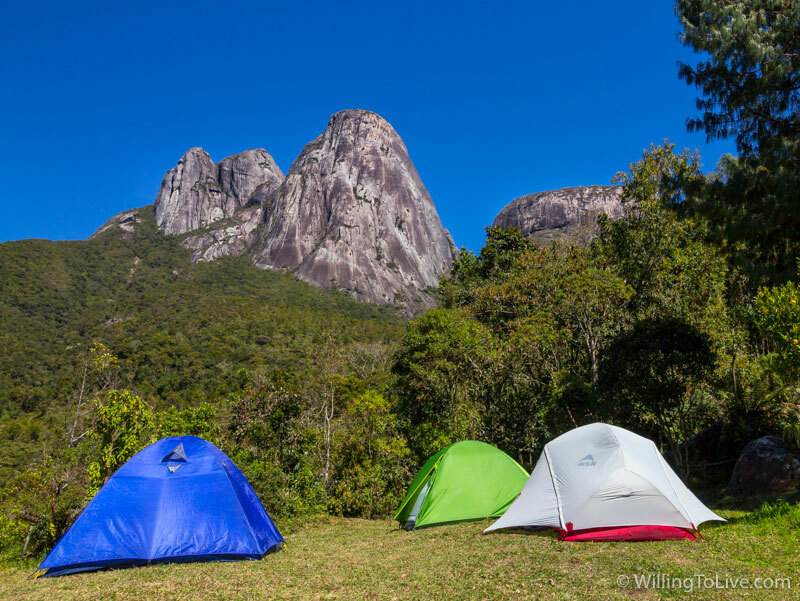 But especially on the road, that connects us to Vale dos Frades, there is cell phone signal. The food that was prepared for us was very good. Breakfast was amazing (we had fruit salad every day!). All of our dinners were themed. We had the pasta day, pizza day (yes, made on the oven that you saw in the last photo and with various flavors) and also the day of the chicken with a secret seasoning that no one ever gets it, really, it is unexpected. But obviously, I’m not going to ruin the surprise by telling you what it is :P.
The only thing that I didn’t like was the thin mattresses, they were a bit old and the foam was not that good anymore. I can say that it was useful as a thermal insulation when I put the sleeping bag on top of it to sleep, but the comfort was poor. But I would easily stay there again, just a little more prepared on this matter of the sleeping bag. By the way, it was my first time sleeping in one. But I didn’t magically appear there in the refuge, there is no teleportation available yet hehe :P. In fact, I went first to Petrópolis by bus from São Paulo (the trip is overnight and only one company makes the journey, Águia Branca, it lasts something between 6 and 7 hours). Waldyr was very kind to us (there was another person going to the expedition coming on that same bus), he took us in the bus terminal with his car. While going to the downtown region, he explained about his city and took us to visit the cathedral. From there, he gave us some tips about where to go and what to visit. We spent the rest of our time walking and chatting around the city downtown area (in future posts I will talk about the photowalks that I did in Petrópolis). After lunch, we met Waldyr again to go to the refuge. The most practical way to get there without Waldyr’s ride is by using Google Maps on your mobile phone. 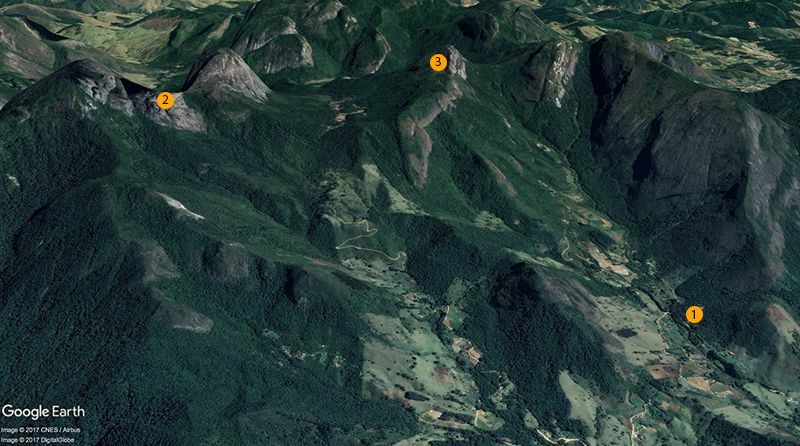 You can search for “Refúgio Canto da Pedra” and it will give you the directions to get there but for some strange reason, it will say that the address is on a street in Goiânia-GO. Don’t worry, just follow the map. We got there the night before (Thursday) of the official start of the tour, we made the first “wine and cheese” (which was repeated every day of the expedition), we had dinner and we chatted until we went to bed. Cheeses and wines that you like, but of course, optional. The flashlight is important for moments without natural light, in other words, before sunrise and after sunset. Remember to charge batteries and clean your gear. Another point, it is cold in mountains. Before the sun rises or after it sets, it gets cold mainly because of the wind. I wore gloves and beanie hat on those two occasions, it was needed. Go to this kind of photowalk always prepared. If you don’t, you won’t be able to enjoy it and there is also the chance of getting sick. In my planning, I considered eating a snack like that in the middle of the morning and another one in the middle of the afternoon. Chocolate is a good option too, especially if it is not too hot, otherwise, it melts in your bag. But for this photowalk, I didn’t take chocolates with me. Why dried banana? Because it spoils less easily, it is lighter and smaller than the usual banana or other fruits. I’m not talking about banana “chips”, it’s dried banana, kind of a raisin, but it’s banana. Got it? The three days of the photowalk were divided into two very active ones (first and second) and a calmer one (the last day). Let’s see what happened. 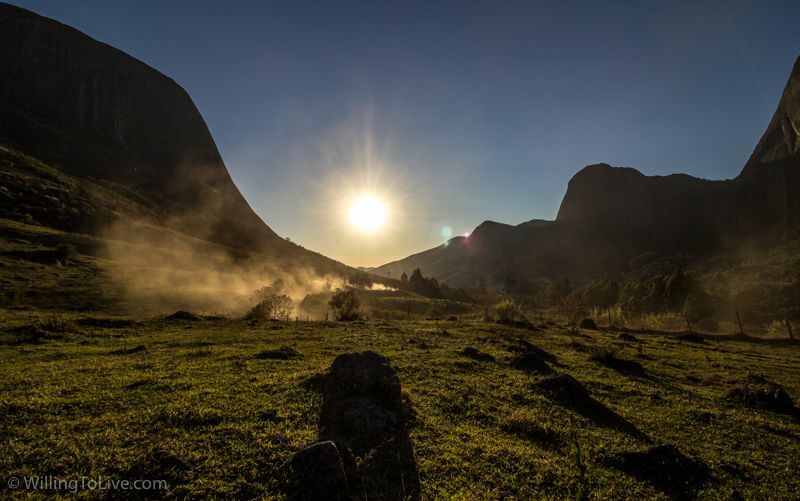 On the first day, the goal was to go (walking) to Três Picos in the morning and in the afternoon go (by car) to Vale dos Frades and stay there until the sun goes down. This day we didn’t get up early. We had breakfast at 7:30 and we left at 8:30, so we didn’t catch the sunrise. 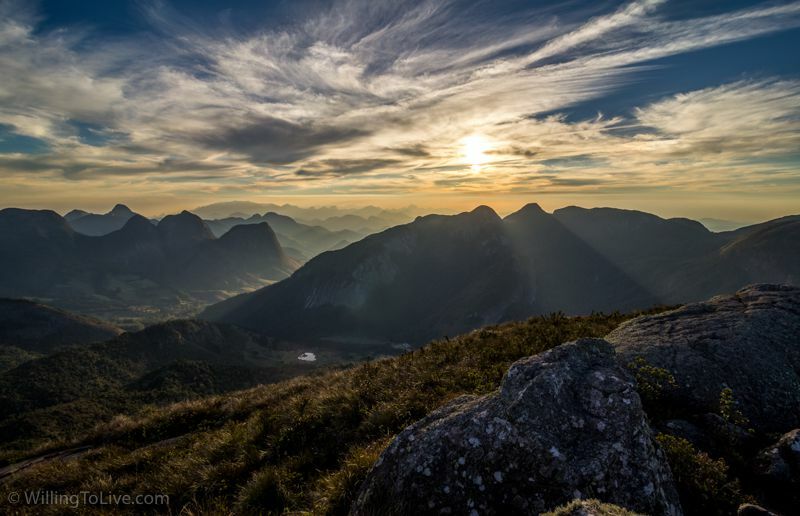 We left the Refuge and walked until we get close to Três Picos. During our hike, we saw some houses and awesome views along the way. We also passed by another refuge that is very close to Três Picos. There, we drank water and observed a person climbing one of the three mountains using a small telescope. After that, we walked a little longer and spent some time there until it was time to return. On the way back we spotted a Lineated Woodpecker! 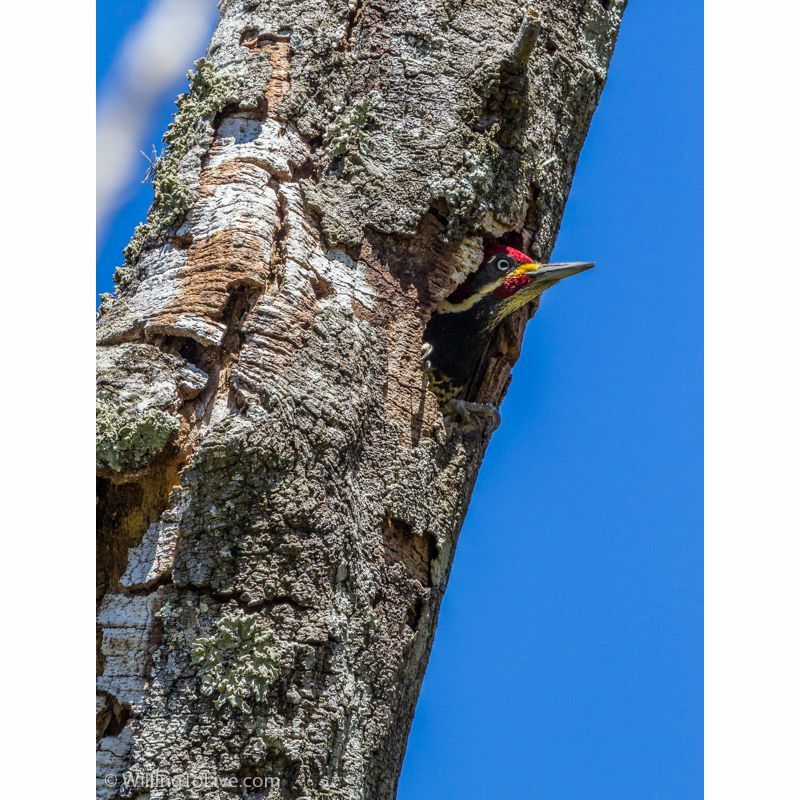 When I got the appropriate lens to photograph it (Adna, thank you so much for lending me your lens and also for helping me with the name of the Woodpecker! ), it was a little shy after the countless clicks the group had already made. So it entered his little “house” and stayed there :). Even after we had stayed there for some more minutes, it was no longer in the mood to pose for photos, so we came back. I only got part of it as you saw above. No problem, it was nice anyway to see the bird :). After lunch, we went to the Vale dos Frades, the round trip was made by car. We got two great views! In the first one, we took advantage of the reflection of the mountains in the water. In the second viewpoint, the sunset was not so cool, since there were no clouds. So I tried to take advantage of the positioning of the light that created elongated shadows of the stones and also a truck that had just passed lifting the dust of the road. In the evening, in addition to the wine and cheese and also dinner, we tried to make some star photos. We did some test shots to feel how it is to do this kind of photo. This was useful for beginners (like me) that have never taken pictures of stars. On the following day, we would get a star shot with a better composition (including Três Picos), so this was a good warm-up for that. When I say we get up early that day, I mean wake up around 3:30 AM. We wake up, pack our bags, and get ready to leave. Breakfast would happen when we come back. This route was made by car. Although the destination is close to where we were, the route lasts around 1h since the road makes a few laps, which for our case lengthen the course. Anyway, we got there around 5:00 AM. It was cold, very cold. As soon as I got out of the car, I wanted to wear my beanie hat and gloves. But even with them, it was colder then what I would like it to be. But I was able to enjoy my time there without major problems. I’m not happy with that image. But this doesn’t really matter that much. I wasn’t there to “complete a sticker album”. The experience of discovering a new awesome place with a group of nice people practicing photography and feeling that I was enjoying my life are much more important. After the “Blue Hour” and “Golden Hour” were went back to the refuge. But as soon as we took the road to return, we came across the sun coming out from behind the mountains. We made another stop :). Sun rising from behind the mountains. Back at the refuge, we had a very good breakfast. After that, we had some free time. Some started to edit their photos, some chatted and some also took a nap (me included, it was very refreshing!). We also had lunch before going out again in the afternoon. 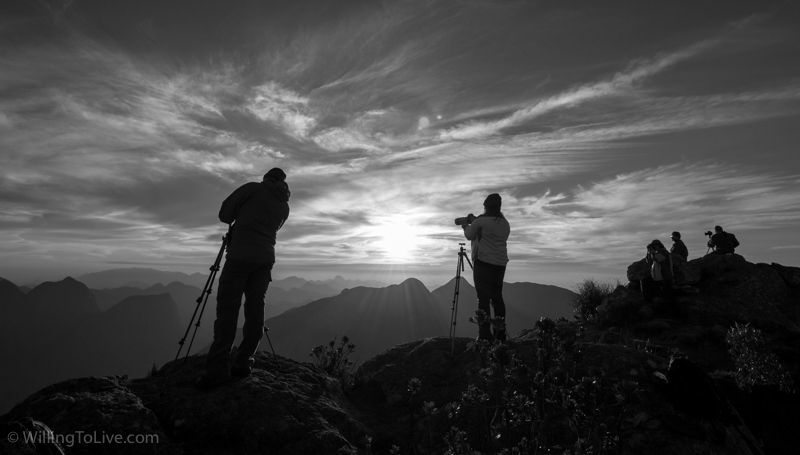 Our mission: photograph the sunset at the top of the Cabeça de Dragão. 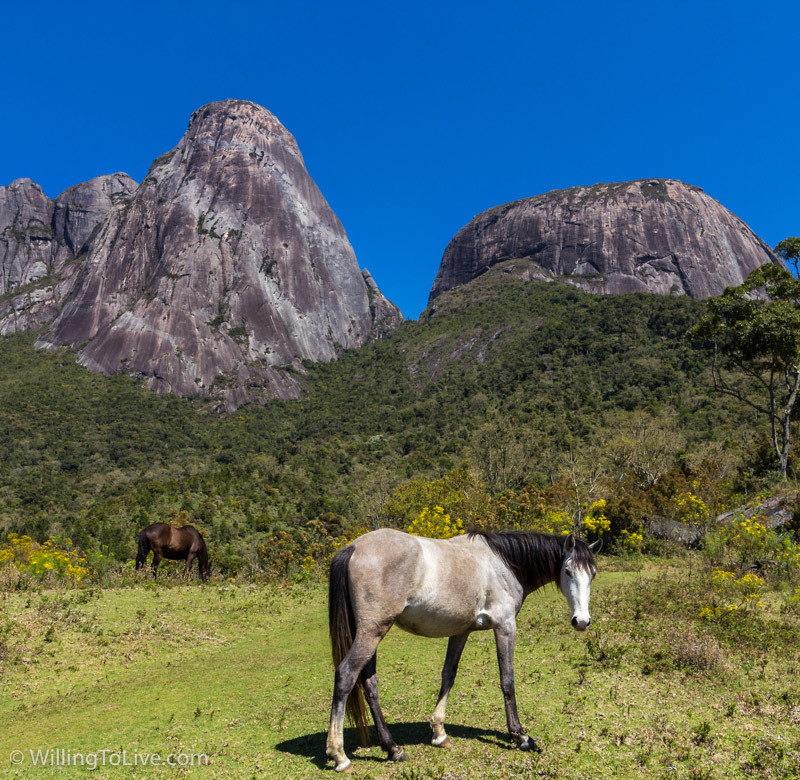 In order to get there, we will follow the same path as the previous day, but at this time, we will not stop in the region where I took the photo of the horse, we will continue until the top of the mountain. This adds to the previous route around two hours of steep climb. In the image below, you can get a better idea of the route. That is our challenge. The starting point, Refúgio Canto da Pedra (1); Três Picos (2); Cabeça de Dragão (3). Image credits: Google Earth, Image © 2016 DigitalGlobe, Image Landsat, Data SIO, NOAA, U.S. Navy, NGA, GEBCO, Image © 2016 CNES/Astrium. Are you ready? Do you accept the challenge? Of course! Challenge accepted. Let’s go! Okay, Waldyr made it easier for us. The first part of the route (the one we did the day before) was made by car. Actually, we used two 4×4, because even in dry weather the road is not suitable for regular city cars. Even though, there were a few not 4×4 cars up there. I really don’t know how they got there and I really do not recommend trying it at all. After the initial route made by car, our new route started at that small house you see in the photograph below. There, we met a girl that works for the Parque Estadual dos Três Picos (en: Three Peaks State Park), she was really nice to us and wished us an awesome hike. The talkative people of our group were silent, but they make it till the top :). During our walk, we made some brief stops and a big stop to see an incredible view of the mountains and also rest, of course. We stayed there for some minutes, really awesome view. 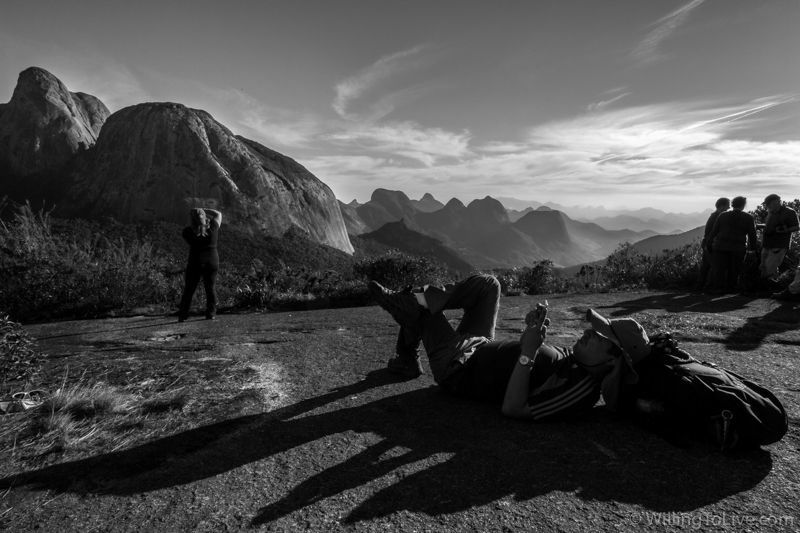 Resting, photographing and chatting almost at the top of Cabeça de Dragão. One of our friends decided not to continue to the last part of the hike, so he stayed there until we meet together again when we were coming back. I’m sure he enjoyed a lot staying there. The view was amazing and we need to respect our limitations. 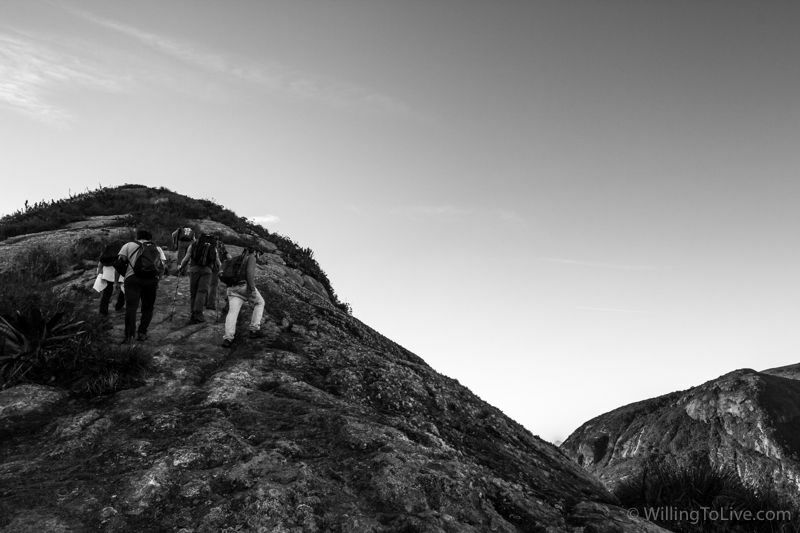 And he also took many photos of our climb, it was very nice :). I’m not really that afraid of heights, but I don’t feel comfortable near the edge of the balconies, for instance. One of the reasons that I climbed Machu Picchu Mountain instead of Huayna Picchu (in Machu Picchu, Cusco, Peru), that is more famous and also less tiring, was exactly because of what I’ve read about them before my trip. Huayna was much more prone for you to stay at the edge of the mountain, facing or with your back to the chasm. Cabeça de Dragão is high, very high. During this last stage of our climb, we don’t have the mountain around us and neither the forest. So the feeling that we have of the place is very different. But it is not narrow, it is quite big actually. But you don’t have anything to hold. Despite the challenge, I made some photographs. This is one of my favorites of the whole trip. Waldyr asked me if I was ok, I said yes. Eduardo, right in front of me, was also supporting me. At that moment, I was not even noticing If I was tired or not haha, I was just very focused on walking one step at a time, very precise steps (falling is not a good option there) and also not looking to the sides. And so I went till the top :) \o/. Everybody was happy! At the top, we were enjoying an incredible view and watching an amazing sunset. We wore our jackets (soon after also gloves and beanie hats) and also took a lot of photographs. Incredible view from the top of Cabeça de Dragão. Waldyr also photographing with us (right). Our group photographing at the top of Cabeça de Dragão. What a privilege to be there on a day with such good weather. As Waldyr said, it was the best weather condition of all his expeditions of that year. This photograph is from Waldyr Neto (organizer of the photowalk). If I’m not mistaken, for this photograph, he has prepared the camera and everything and it was just missing the click to get the picture. So he asked me to do it when he got to his desired location. Glad that I could help, even just a little very small bit, to make this wonderful photograph possible. After the nature show, it was time to come back. To my surprise, it was much easier than the climb. Since there was no more natural light, just the light of the flashlight, it was just possible to see what was being illuminated. This made me feel much more comfortable, it’s a psychological stuff, right? But don’t get me wrong, this does not mean you can neglect your way down, of course not. One step at a time, very focused. After we went back, it was time for the famous photo of the stars. Besides the warm-up of the day before, it was my first time photographing stars. Usually, we learn something in these situations. It happened by chance, but Eduardo made a light painting when passed in front of my camera with his flashlight on. He apologized, but I think the final result is cool. It was no different. I don’t think that this photograph is good. The stars are not dots, they have a small trail. I think you remember that the stars are always moving. 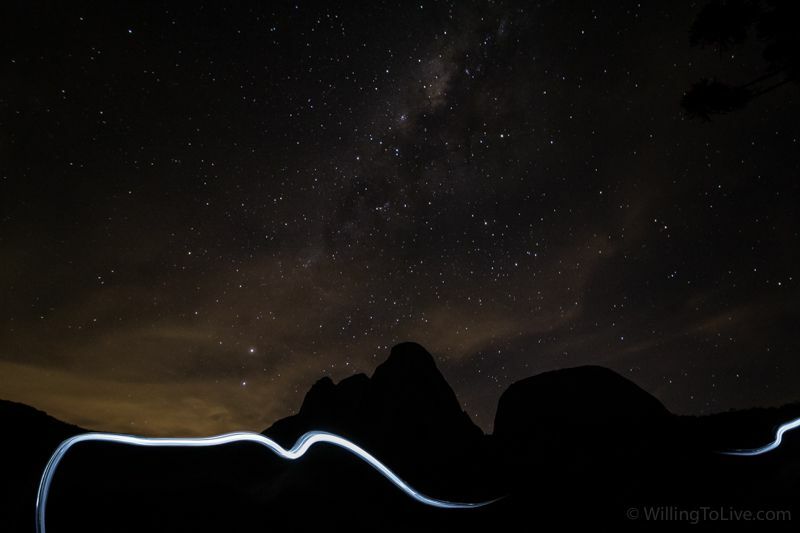 With the long exposure (I was using 30 seconds), the stars moved during the shoot, that’s why they have a trail. The dilemma of this photo is that with ISO at 1600 or above, my camera already has a lot of noise, so I increased the exposure time because the lens was already wide open. But with longer exposure time, I got small star trails. Comparing my photo to the photos of the other guys that were there with me, what usually is not a smart thing to do, but being aware to just consider the constructive part of the comparison, I may say that it seems that we were not at the same place at the same time hahaha. Their photos show the milky way much more visible than mine, for example. However, instead of complaining or saying that the camera/lens is bad, that you have to buy this or that and blablabla, the best thing to do is to find another alternative. I could have done a star trail photo. I will research more about this for my next star photo. Photos made, time to get back to the refuge and have dinner. And to top it off, we returned to the refuge listening to rock classics :). After a climb in “overcome mode”, of that amazing view of the mountains, of awesome photographs and also the soundtrack in the car when coming back, there is no way I can’t say that was the epic moment of the expedition :). We made our wine and cheese, had dinner and went to sleep very happy for an incredible day we had just lived :). The goal of this day was to relax and rest after the incredible but tough previous day. The majority of the group came driving, so it is important to be rested before driving home. In my case, I was not going home, I would spend two more days in Petrópolis (more about that soon). Resting or not, we won’t lose some more clicks. After our lazy early morning and breakfast, we went for a walk to another refuge nearby. There were two guys playing music (guitar and drums) and we were also able to try some local beer. Some of our group went home before the walk, others shortly after it. For those that stayed, we got back to the Refuge, had lunch, packed our bags and came back to Petrópolis. Waldyr, again very nice with us, gave us a lift to the bus terminal and in my case to the very good hostel where I stayed for the next two days. As you can see, we have been blessed with good weather during the whole trip and also an incredible sunset in the top of Cabeça de Dragão. Talking about safety, I felt safe all the time during our expedition. It was very nice. 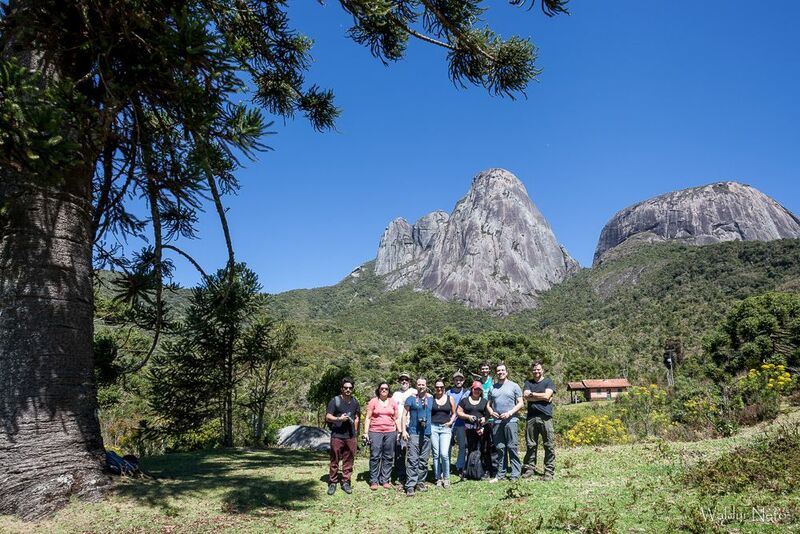 As I noticed, the other visitors that we met at near Três Picos were climbers or regular visitors just going for a walk. It is not that easy to get there, so this helps to prevent thieves going there ;). The exception may be just the waterfall in Vale dos Frades. During the first day, we went there by car but we didn’t stop because it was too crowded. When we came back in the second day, the whole place was empty, what makes sense due to the time we get there (5 AM, almost no natural light and very cold hahaha). There is no doubt that our group also contributed making the trip excellent. Very nice people, friendly, funny and new friends were made. I think all of us were there searching for the same thing. 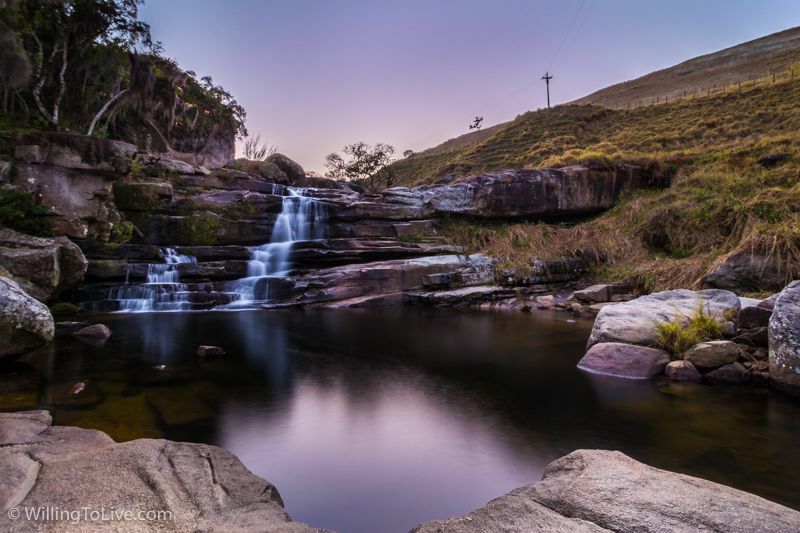 Peace, tranquillity, adventure, and fun with a lot of photography involved :). What else do you want? Thanks a lot! It was an amazing weekend! This image is not mine, it is from the photographer and organizer of the photowalk, Waldyr Neto.